For an impressive, festive holiday appetizer, make this Christmas wreath recipe — it’s guaranteed to impress your guests. While some may initially be hesitant to take apart such a work of art, the call of the variety of Cheddar cheeses, tomatoes and French bread that make up this antipasto Christmas wreath will eventually be too strong, and they’ll be digging in! Share this favorite Christmas wreath appetizer with friends and family on Facebook, Pinterest, Instagram, and Twitter. Form two tubes of refrigerated French loaf dough into a single ring, pinching the ends together firmly. Bake according to package directions (but do not slash the tops). Once the bread ring has cooled, cut an angled trough in top with a serrated knife, then pull out more bread to make the trough deeper. Place ring on a serving plate. Break or snip rosemary into short lengths. Poke holes in the side of bread ring with a wooden skewer and insert rosemary sprigs, placing shorter ones on top and longer ones underneath. Place platter in a plastic bag and refrigerate until ready to serve. Just before serving, fill ring with cubes of a variety of Cabot Cheddar cheese flavors and tuck in red and yellow grape tomatoes. For another show stopping Christmas cheese tray appetizer, try our Festive Cabot Cheddar Tree or watch one of our Holiday Appetizer Video Recipes! As a co-operative of over 800 farm families, our goal is to make the highest quality and best tasting cheddar cheese and dairy products you’ll find. 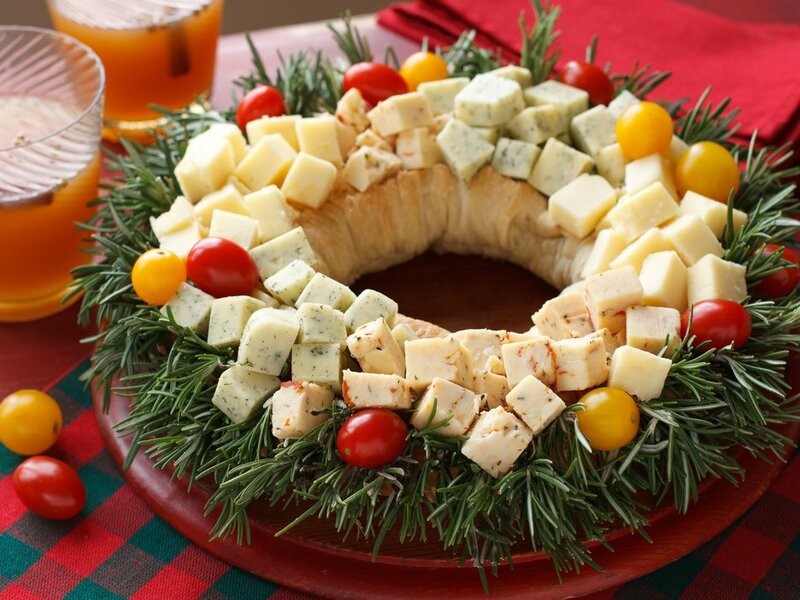 We’d love for you to rate and review this Christmas Cheddar wreath recipe once you’ve made it! FORM two tubes of dough into single ring, pinching ends together firmly. Bake according to package directions (but not slashing tops). Once bread ring has cooled, cut angled trough in top with serrated knife, then pull out more bread to make trough deeper. Place ring on serving plate. BREAK or snip rosemary into short lengths. Poke holes in side of bread ring with wooden skewer and insert rosemary sprigs, shorter on top and longer beneath. Place platter in plastic bag and refrigerate until ready to serve. Fill ring with cheddar cubes and tuck in grape tomatoes. *Try Cabot flavors such as: Cabot Smoky Bacon Cheddar, Cabot Jalapeno Lite50 Cheddar, Cabot Tomato Basil Cheddar, Cabot Chipotle Cheddar, Cabot Garlic & Herb Cheddar, or Cabot Vintage Choice Cheddar.